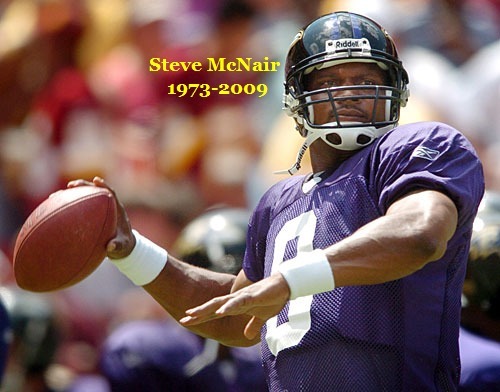 NASHVILLE, Tenn. July 4, 2009 03:07 PM - Former Titans quarterback Steve McNair has been killed. Police said McNair suffered a fatal gunshot wound to the head in downtown Nashville. The incident happened near 2nd South & Lea Avenue. A female victim was also found dead. According to Don Aaron with the Metro Nashville Police Department, no suspects have been taken into custody. Several people were being taken to police headquarters for questioning. Always seemed like a kind, humble guy. Died way too young. RIP Steve. WTF is going on ppl???!!! Now they are saying the girl shot him multiple times and then shot herself in the head. Steve bought her an Escalade which she proceeded to get a DUI in, 3 days ago. She was a waitress at Dave & Busters and he was dating her even though he is still married. They found him on a couch and her just below him with the gun at her side. 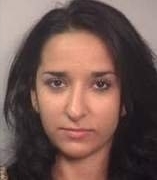 Her name was Sahel Kazemi. damn. this whole ordeal is going to open a can of worms. Looks like one crazy b1tch! Been reading about it and watching ESPN last couple days, I'd be shocked if it wasn't a murder/suicide by the girlfriend. Sure looks that way. Investigators have ruled Mcnair's death as a murder, but aren't yet going public with their ruling on the girlfriends death. AND they aren't currently looking for suspects... Seems like they're just waiting to make it official. Wow I haven't even heard about this! That's absolutely ridiculous! Money and fame will do wonders for some. Wreak havoc on others. Be it a celebrity, athlete or whatever. Some just choose chaos in their lives. It's in their nature. No lie if it were me who stumbled across the next invention like Velcro or Windows, my azz would be sitting inside a humble home somewhere in Colorado, with my kids and their grand kids' life set, shooting pool in my gameroom watching the news and laughing. Living a safe life. Why risk losing it all on BS? Powerball winners frequently and eventually file for bankruptcy. I just don't comprehend the madness. Maybe that's what makes it so fun to watch lol?